Dress by Maria Nordstrom. Boots, Noomi’s personal. Top and skirt by Givenchy by Riccardo Tisci and gloves by stylist studio. Necklace by Delphine Charlotte Parmentier. It’s been a week since Noomi Rapace finished shooting her new thriller Unlocked alongside Michael Douglas and Orlando Bloom. Her lead character, a CIA agent, has been described as a female version of Jason Bourne. The shoot was physically exhausting and went on for almost four months. Noomi is one of the actresses getting the most interesting parts in international movies right now. To no one’s surprise, as she’s become known for her hard work developing her characters. If the background story isn’t comprehensive enough, she’ll develop or create her own stories. The women she portrays can be fragile, broken and scarred, but when Noomi embodies them they are never reduced to victims. ”I’ve often made changes to scripts to achieve something more multi-layered and complex. When I start working with a director, and I find that it’s not all there on paper, I’ll be like ‘This is what I would like to do. And I think that if we would do it this way it will be much more interesting and give her a more complex personality’. And usually everyone’s onboard. All dressed in black, Noomi is sitting at the bar having a coffee. Outside the window it’s a dark and cold winter’s night. Last time I interviewed her she had broke onto the scene as Lisbeth Salander in The Girl With the Dragoon Tatoo, and had her big international breakthrough as Elisabeth Shaw in Ridley Scott’s Prometheus. ”The last week of shooting ”Unlocked” I was hanging from a construction site, upside down with one arm, 12 stories up in the air. I wore a safety harness and was about to be sick as I looked down. I am so afraid of heights, but I didn’t tell anyone. And they’re all ”You’re so cool with heights”, and I’m like ”Yeah, yeah, sure”. If I admit to being afraid, let that into my psyche, that’s it- I’m finished. If I had said those words out loud – “I’m afraid” – it would have been impossible for me to go through with the scene. What’s your strategy to get over your fears? “I just focus really hard, and figure if I fall, I fall. But above all, I hate loosing. I hate not being good at things, and I can never back out once I’ve committed to something. So you compete against yourself quite a lot? “I guess that’s how I conquer my fears again and again. Giving up is just not an option. So it’s an ongoing battle between my two sides: the side of my personality that is more rational, and a bit afraid, and the other side that is braver, more optimistic and a risk-taker. It’s a kind of self- contempt versus self-confidence thing. For Noomi, it’s important to work with people that she thinks are good at what they do. Feather bolero worn as skirt by Tim Mårtenson/Tim’s Time and one sleaved feather bolero by Saint laurent by Hedi Slimane. Top and skirt by Givenchy by Riccardo Tisci and gloves by stylist studio. The past couple of years Noomi has spent a lot of time in London and last fall she finally moved there. She lives with her son Lev, soon 12, and one of her half-sisters, in an old blacksmith’s workshop near Notting Hill. “I was 15 when my sister was born and we’re very close. She’s the one who encouraged me to settle down, because I’m a bit of a nomad. In recent years I have lived on movie sets, in hotels, temporarily with friends, and have felt like a traveling circus with all my bags. Now, for the first time in a long time, I have a home. “I love London, and most importantly, a lot of movies are made here. For me being based in London makes so much more sense, because I’m in the process of starting a production company and we already have four different projects in development. “Producer and co-owner. I’ll be in some of our movies, but the company is mainly a way to work with people and projects that I believe in. There are stories I want to tell and people I want to work with, and eventually maybe I’ll direct something myself. As Noomi isn’t shooting anything this month, she’s taking the opportunity to work on getting the production company underway. How does that usually play out? Since the theme of this issue is death, tell me a bit about the photo-shoot. “We created a character who flirted with a death realm in order to be resurrected. In a way that’s like what I do in movies. When I finish a project it is as if part of me dies, and then I’m resurrected again in a different guise, and nothing is permanent. The moment has passed as soon as it has been captured on film. It is a very brutal art form, when you think about it in that way. And it’s also quite beautiful. I think change is enormously important. The most dangerous and boring thing is when everything comes to a standstill. Movies often are about life and death, aren’t they? “Yes, they are. A late night years ago, I wrote “Do or die” on my friend’s bathroom wall. Because that’s pretty much what my life has been like. 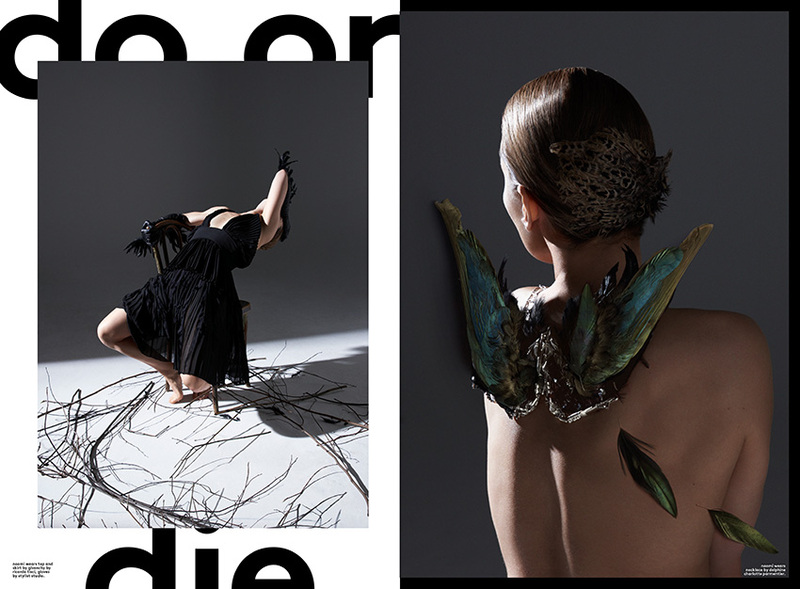 Dress by Yohji Yamamoto and wings by Tim Mårtenson/Tim’s Time. Pants by Acne studios. 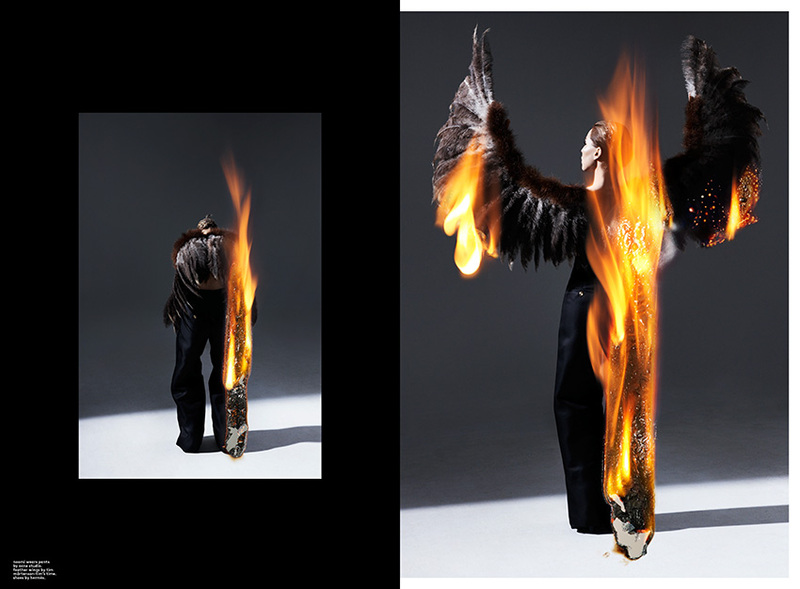 Feather wings by Tim Mårtenson/Tim’s time and shoes by Hermès. Noomi tells me about a Danish professor she met the other day, who said that we should all think more about death. “We should remember that we only have one life. Don’t waste your time. Don’t waste your days, live now and take advantage of life. If you just remind yourself more often that we aren’t here forever, you may end up speaking to your children in a different way, working differently, your choices will be slightly different. For example, I think social media can be destructive, fake communication. I think these disruptions are dangerous when it comes to love, relationships and your own conversations with yourself. If you contemplate death, and feel the presence of death, how much time do you really want to spend with your phone? It’s easy becoming a victim to it. When we meet, Noomi has just finished three major projects. In addition to Unlocked, she’s also in The Drop and Child 44. In The Drop she stars alongside Tom Hardy and James Gandolfini. Her character Nadia has a shady past. In her research for the part, Rapace visited strip clubs in New York because she envisioned Nadia having worked there. She worked with Tom Hardy again in Child 44. What’s your character in Child 44 like? “Her name is Raisa and she’s married to Leo, played by Tom Hardy. It’s set in the Soviet Union during the last years of Stalin’s rule. Society is permeated by fear and paranoia because of the informant culture. Raisa has looked the other way many times, in order to survive. She feels self-loathing but at the same time she is passionate about the truth and rectifying what has been done wrong. Leo has also tortured and killed for the government. When they discover each other and fall in love, they experience a form of awakening and start seeing what they’ve done. But it’s also a thriller where they investigate a series of child murders, which proves difficult as serial killings were claimed to be a disease of the west, and not something that happened in the Soviet Union. Let’s go back to death and dying for a little bit, to conclude. A short piece of advice that would replace all self-help books might be ‘Live and remember that you’re going to die’? 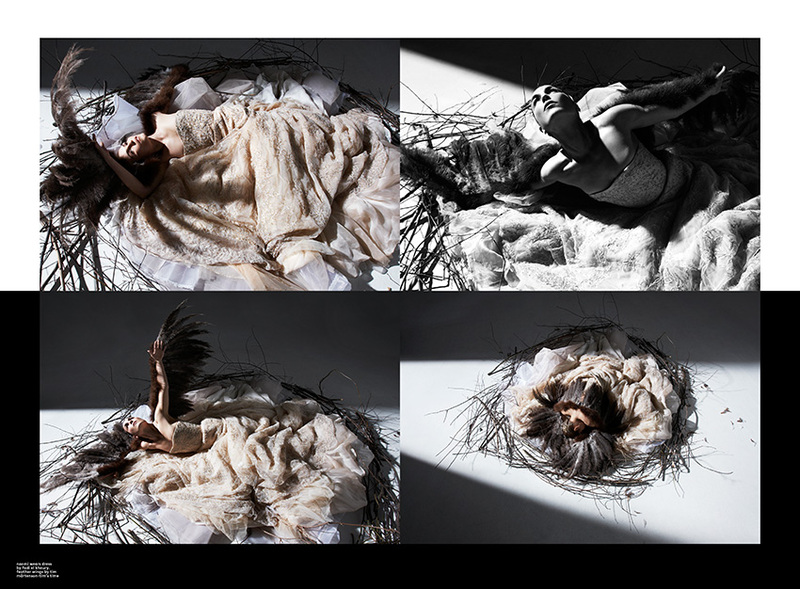 Dress by Fadi el Khoury and feather wings by Tim Mårtenson/Tim’s Time.